This street was named after the St. Daniel monastery that has been existing here since the end of 13th century. This monastery had been restored by 1988 (when Russian orthodox church was celebrating its millenium), and today it is the residence of the Patriarch. 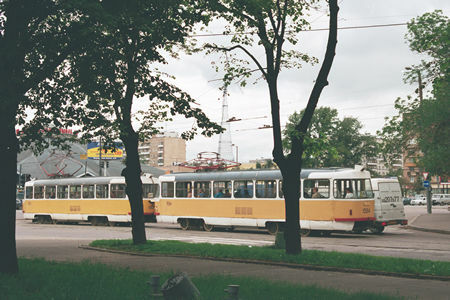 As for the tramway, the line was built here in 1950 as a replacement of the previously existed line in Bolshaya Serpukhovskaya Street. 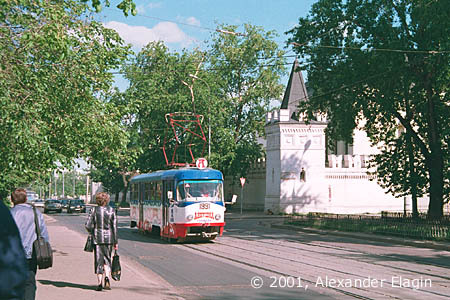 A tram near the main entrance of the monastery. This day was rather cold, it was something like 25 degrees centigrade below zero. 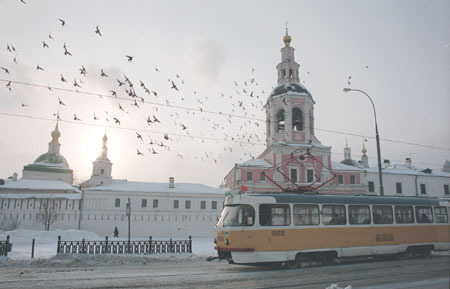 One of the fortress towers is located at the corner of Danilovskiy Val and Pavlovskaya Street. 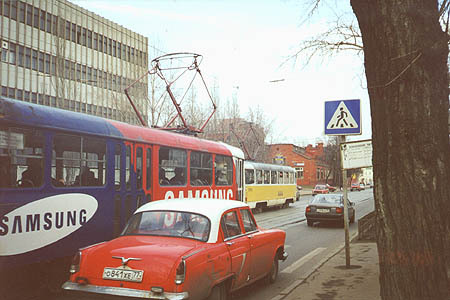 Serpukhovskaya Zastava tramstop in Danilovskiy Val. How could I imagine to catch this combination of colours and this historic (but looking like being in regular use) motorcar? Maybe I was lucky that day. 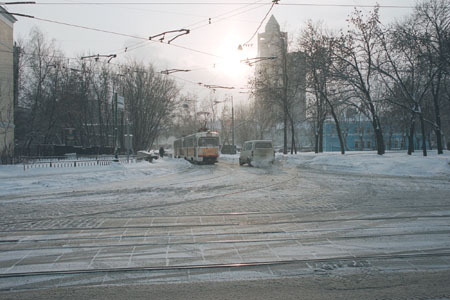 A crossing of Danilovskiy Val with Kholodilniy Pereulok which hosts another tramline, bound to the southern districts of Moscow. The winter sun dimly shines beyond the pencil-like skyscraper of the tax ministry. Danilovsky Val enters a large space of Serpukhovskaya Zastava square, as well as six more streets do. 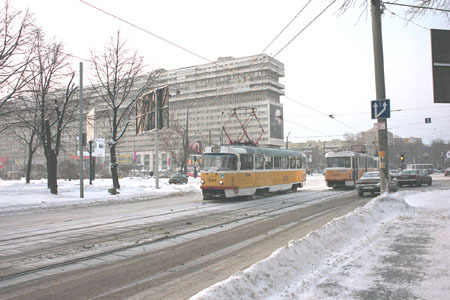 This square is heavily congested therefore traffic jams also involving trams are rather frequent here. Another view of Serpukhovskaya Zastava, now with a very long building that stretches along Bolshaya Tulskaya Street. Having crossed the square, the line continues in Serpukhovskiy Val Street.